Yesterday at Computex 2014, Intel revealed the Devil's Canyon chips to the public. Sadly, they won't be available for purchase this instant. We'll have to wait for another 3 months for that. At least, there were few positive things about the unveiling. First of all, the clocks are identical to what the leaks were saying. 4GHz base/4.4GHz boost for the 4790K and 3.5GHz base/3.9GHz boost for the 4690K. 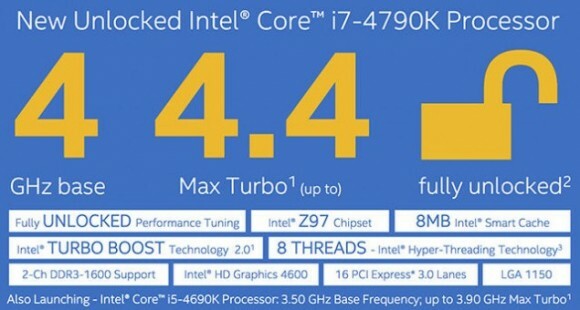 It's interesting to see how confident Intel are to release the 4790K at such high clock speeds. And the TDP is 88W for both of them. Secondly, the pricing. Both chips aren't that much expensive than what the 4770K/4670K are priced at. I thought Intel would ask for a huge premium for them. But not the case. They are asking $250 for the 4690K and $350 for the 4790K. Quite reasonable, given the pricing of the entire lineup. But that makes one wonder if it is possible that these CPUs aren't as good as what we were made to believe. Unfortunately, I have a feeling that this is indeed the case. There aren't many reviews out there and there definitely aren't any reviews that have explored the overclocking potential of these CPUs. But something that Hexus posted on their initial review is concerning. They had the following words to say about the temperature of the CPU. A word or two about temperatures: Intel says it is to use the same processor-in-box (PIB) cooler for this chip as for the 4770K. We used just such a heatsink during regular testing and found that, due to the extra power consumption generated by higher voltages, the Core i7-4790K ran hotter, at an average of 88C, compared to 78C for the older Haswell processor. This is not what I expected to see. I expected to see it at least run as hot as the 4770K while maintaining the 10% or so performance lead over the 4770K. Ideally, I wanted to see the 4790K running cooler than the 4770K but faster at the same time. But what's happened is that both the performance and the temps have gone up. I would expect the 4770K to behave no different to this when overclocked. In fact, it might even run cooler. Perhaps. In my opinion, the initial results aren't exciting. There have been some overclocking competitions at Computex and it seems the highest overclock that they were able to achieve with water cooling (I believe this is a proper water-cooling loop, maybe with multiple radiators) was about 5.5GHz. Yes, it is better than the original Haswell chips, but who knows whether or not these CPUs weren't cherry picked CPUs? It is like binning the binned CPUs. Still, I am not all that enthusiastic about Devil's Canyon. I will wait for more concrete evidence that Intel is not pulling another stunt with what they are sending to the reviewers. I hope we would see more and more reviewers testing the retail CPUs and not these Engineering Samples. If this turns out to be a failure, I would probably delid my CPU and be happy with what I have.